Last time, I wrote a few thoughts about the latest natural disaster to strike our nation, what’s now called “superstorm” Sandy. I tried to “make sense” of what happened to a big city like New York and small towns down the Jersey coast. If you missed the post, read on. Sandy was not kind to Long Beach. The Ocean met the Bay. Every street and home on the island got flooded. Still no Water, Sewer, Electric, Heat or … Newspaper Delivery. OK. No mail either. Needless to say, no internet, cell or email either. I need to drive to Rockville Centre to batch send and receive emails. That requires gas which is a scarce commodity. Gas lines if open are best part of a mile and about 3 hours long. Estimates for water restoration are several days; power 10-14 Days and train service in Weeks. Teams are here in force from the National Guard to Homeland Security and State Troopers to FEMA. Apparently the City of Long Beach lost many of their vehicles. So we are seeing ambulances, fire trucks and police vehicles from throughout NY & NJ. The furthest helpers are Serve-Pro trucks from Jackson Mississippi. Attitude is great! Everyone is cooperative. Its reminiscent of the “Era of Good Feeling” after 9/11. Long Beach is getting Red Cross relief and Meals Ready to Eat. Verizon has a station for short calls and phone charging. We’ve got Helicopter patrols along the perimeter. For three days we had road blocks manned by the State Troopers. They were assuring we had only residents coming in – keeping out the sight seers or potential looters. 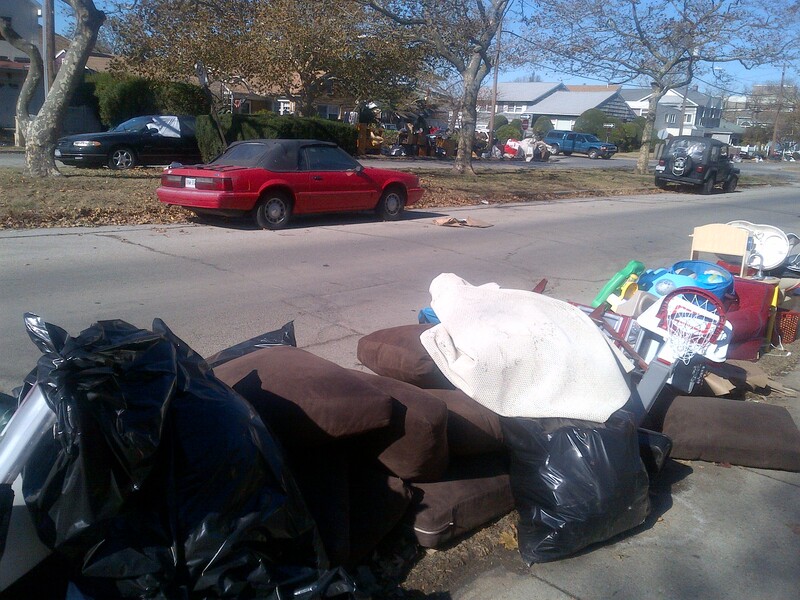 The Rockaways also go hit by both the weather and some looters. No they’re pissed that they’re not getting the same TV coverage that Long Beach is. Same for Staten Island. See, everyone is simply jealous of Long Beach. I want to post a sign at the entry to Long Beach. And another in Island Park where there is a 40′ boat stranded just opposite the 7-11 parking lot. And the adventure continues! A good sense of humor helps a lot! I’m actually enjoying cooking everything on a. BBQ from Bacon & Eggs to Pasta. Roasting potatoes and Brussel Sprouts just take longer. Since everyone is Safe and Sound, Its (sic) merely an inconvenience. Note the optimism in Paul’s thoughts, and the humor. How he equates the spirit of cooperation in his town to the “let’s pull together” spirit that arose following the terrorist attacks on September 11. Yes, there’s no doubt that Long Beach will dry out and people will rebuild. So will New York and the little towns up and down the Jersey shore. This shake-your-fist-in-the-face-of-adversity attitude is distinctly American. It’s present — or it should be — from Long Beach, New York to Long Beach, California. On this evening, just hours from the opening of polls, just hours from the 2012 presidential election, I hope every American who is eligible will vote. Shake your fist in the face of the adversity our nation faces and cast your ballot. I’ll bet the polls will be open in Long Beach. 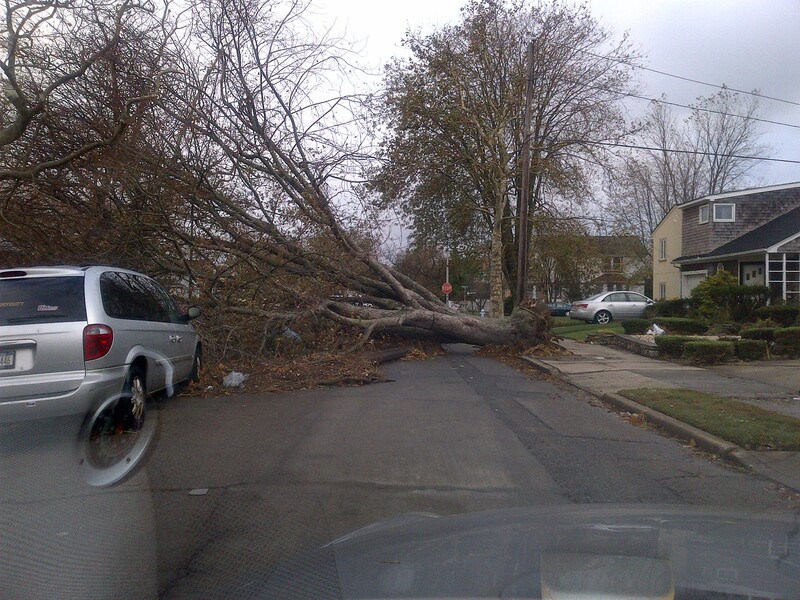 This entry was posted in Uncategorized and tagged Hurricane Sandy, Long Beach, New York, superstorm Sandy. Bookmark the permalink. Hello: Can you please translate to English? Thank you.